Not available for Kindle or in the iTunes Store, although the latter has the original Italian version Storia delle terre e dei luoghi leggendari for £10.99; it is the best way of enjoying the illustrations, but see below for further comments. We are used to ‘urban myths’ and the astonishing unreliability of much that we read on social media, and the Internet more generally. This is hardly new, of course: long before the printing press, humans were imagining, fabricating, and embroidering stories and pushing them out as fact. Umberto Eco, one of the greatest minds of the day and a true polymath, is well known. His fiction, books such as The Name of the Rose, have sold well, that in particular making a superb movie (1986), and his non-fiction is even better. I am not sure how I missed the publication of this particular book two years ago, but as it has now been printed in paperback, I wish to draw your attention to it. A professor of semiotics and a leading expert of medieval philosophy, Eco knows this subject as well as anyone alive, and it is a joy for him to share what I can only describe as his mindstream torrent with us. His text is the distillate of a lifetime’s study of the legendary lands which were as real to many in the past, as the streets of Los Angeles are to today’s movie-goer. Each chapter consists of Eco’s whistlestop tour of the topic, in which he highlights the key literature and ideas in that area. Following that there are a series of short excepts from primary sources, carefully referenced so that the interested reader can access the whole source if so interested. The chapters cover all the major types of legendary land which fall within Eco’s scope, starting with the world as a whole, passing through biblical lands, those of the Classics, a colourful character named Prester John, earthly paradises, Atlantis and relatives, Ultima Thule, Alamūt, Cockaigne, Utopia, the Island of Solomon, the earth’s interior, and Rennes-le-Château. Eco rounds off this virtuoso tour with a quick consideration of some fictional places with real-world connections. Even if you think that you are familiar with those legendary lands, Eco’s broad understanding and ability to draw together diverse threads will better inform you. He maintains a brisk pace throughout, never leaving the reader’s mind to wander far from his narrative. In short, Eco’s writing is rapier sharp and completely compelling. However – and I am afraid that this is a very big however – this book appears to be two quite separate volumes interleaved and bound as one, because the illustrations and text do not cross-refer. It is as if an editor decided that Eco’s words could not be published without ample illustrations, and commissioned someone else to drop those in. This is not to say that the paintings and other works of art included are inappropriate or weak: the collection is absolutely wonderful, very extensive, and even without Eco’s outstanding text would justify purchase. But I have been unable to find a single textual reference to one of the illustrations, and the captions do not refer to sections of text either. It is that weird. For example, the opening chapter deals with mythologies about the earth and its geography. The first illustration, on page 10, refers to “T and O map”, which is not mentioned or explained in the text until page 14, where Eco writes a specific reference to T and O maps in the manuscripts of Isidore of Seville. None of the illustrations in that chapter shows any of Isidore’s manuscripts, although some other T and O maps are shown, unreferenced by the text. On page 413, there is an illustration (all are unnumbered, which would make reference tricky anyway) showing Courbet’s Cliffs at Étretat (1869), a wonderful painting which is a delight to see. But I cannot find any reference in the text to those cliffs, that location, or Courbet, which might link it into Eco’s chapter about Rennes-le-Château. However over the page, on 414, Eco discusses Poussin’s enigmatic painting Et in arcadia ego, which is illustrated on page 415; again there is no reference in the text to that figure, as if Eco himself was unaware that it would be included. 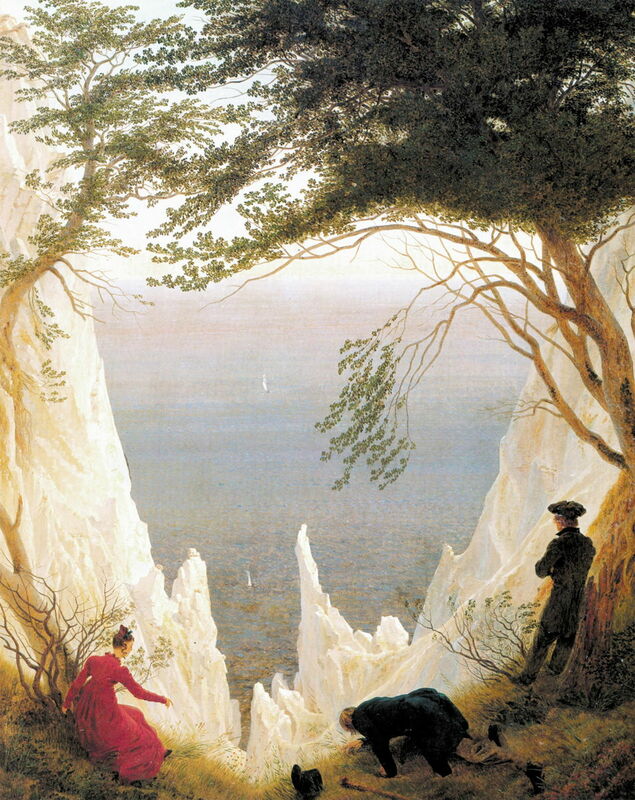 Caspar David Friedrich, Chalk Cliffs on Rügen (after 1818), oil on canvas, 90.5 × 71 cm, Museum Oskar Reinhart am Stadtgarten, Winterthur, Switzerland. Wikimedia Commons. Included in the book, on page 365, and discussed in the text. The back-matter is extensive and valuable too: separate indexes of authors, artists, anonymous illustrations, and film stills, references to English sources of the primary sources quoted, and an excellent general bibliography. I could not have wished for more. Alastair McEwen’s translation is generally excellent, polished, and beautifully idiomatic. My final and most bitter complaint is about the quality of reproduction of the illustrations. Described on the dust-jacket as “a beautifully illustrated volume”, I can only think that was written by someone with uncorrected hypermetropia. The larger format of the hardback version reveals that all the colour figures are of slightly lower resolution than would have been optimal for print, and is almost identical to the enlarged images available from the Italian iBook. Detail of example illustration from iBook (left), and the same area from this blog (right). 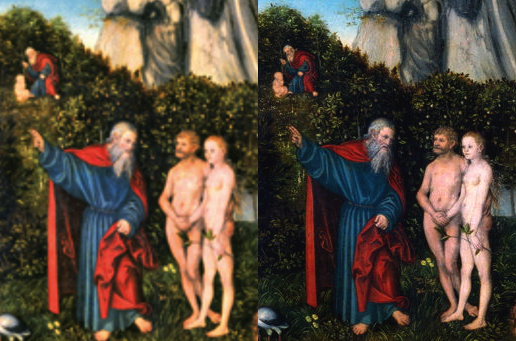 This is obvious when comparing a detail from the image shown in the iBook (p 148, in the above image, on the left) with that published here (on the right) of Lucas Cranach the Elder’s The Garden of Eden (1530). The image which I used was scaled down from an original at 4691 by 3174 pixels to 1173 by 794, and contains considerably more detail than the image in the iBook or the printed book. In those, it is difficult to tell Adam apart from Eve, except for the former’s facial hair. This implies that, in this image at least, the publishers were working from images of 1000 pixels in their maximum dimension, or less! I have, in a previous review, taken a publisher to task over the quality (and, there, quantity) of images, and was informed that, as they are not art publishers, it was unreasonable to expect otherwise. If you want to claim that your book is “beautifully illustrated”, then as a publisher you must take reasonable steps – licensing high-resolution images, ensuring high-quality reproduction – to achieve that. Unfortunately this problem with illustrations is compounded by the fact that the new paperback edition, published in the UK this month, is significantly smaller in size than the hardback. To be blunt, this makes almost all the paintings within it unintelligible, unless they are in double-page spreads. For the difference of £10 in price, the hardback is the far superior book, unless you have no interest in the illustrations. The iBook version also has the occasional electronic publishing error: for example, the captions to Poussin’s Spring (1660-4) and al-Shirazi’s Elias (1548) on pages 144-5 have been transposed, which was briefly entertaining. The text is justification for purchase, and the illustrations in the hardback version, although of mediocre quality, are wonderful. I recommend that you buy the hardback edition, supplemented possibly by the Italian iBook. But wouldn’t it have been so much better if the publisher had taken a little trouble to cross-reference the text with the figures, and to match the quality of reproduction to that of Eco’s superb writing? Posted in General, Language, Life, Painting and tagged book, Eco, legend, literature, painting, review. Bookmark the permalink.